It’s been a busy week. We went to our storage unit and threw out a skipload of stuff. The rest of it either went to the boat or into a friend’s basement, which meant that we could shut down our storage account and save hundreds per month. Having completed all of our removals, we sold the ute and used the money to provision the boat. We are ready. Almost. (1) The superstitious horror of our sailing friends. (2) The tail end of Cyclone Hamish. (3) While filling the fuel tank, the filler cap broke off and fell off into the sea. Naturally we can’t find a simple replacement, so I’ll have to fit a new through-hull unless we want water in our diesel. (4) I was expecting some rock samples for my postgrad correspondence course, and they’re currently lost in courier-land, so I have to hang on to the motorbike until I find out where they are, in case I need to go and get them. 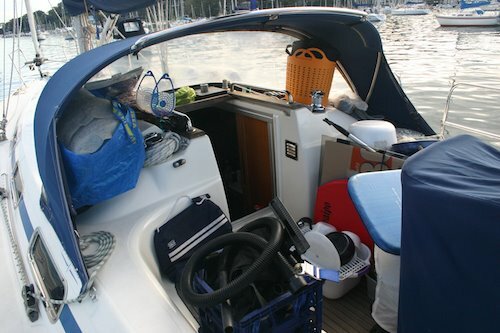 (5) All that stuff that we moved to the boat, is still in the cabin and littering the deck, because we haven’t yet figured out where to put it. On the plus side, we see that (finally!) the Bureau of Meteorology is forecasting a whole week of gentle Southerlies starting tomorrow, which is exactly what we’ve been hoping for. This entry was posted in Australia, Oceania, Travel, Voyage of Pindimara and tagged Sail on 2009/03/14 by Reinhard. all the best – just dump the stuff overboard if necesary………. We’ve added a link to a Google Map of our voyage, which should make it easier to figure out what is going on.